L’Ecuyer has been a top-level leader in for-profit, nonprofit, and government organizations. Most recently, she guided all aspects of internal and external communications strategy for the Girl Scouts – Arizona Cactus-Pine Council, one of the nation’s largest local Girl Scout organizations. Previously, L’Ecuyer was the Vice President/Corporate Communications for Ecotality, Inc., a startup company providing the nationwide charging infrastructure for electric vehicles. She also served as Director of Communications for Ziemba Waid Public Affairs, managing message strategy and media for the company’s wide range of political, corporate, and government clients. For five years, L’Ecuyer was Deputy Chief of Staff for Communications and Press Secretary for Governor Napolitano. In that role, she was the Governor’s spokeswoman and the point person for the critical communications work of dozens of state agencies with specific emphasis on delivering coordinated, consistent, and effective messaging. Prior to her time at the Governor’s office, L’Ecuyer spent more than 20 years in the business of television news as a reporter, producer and manager. 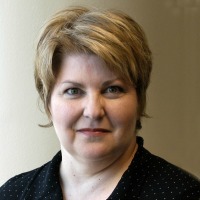 She managed the news division at the NBC affiliate in Phoenix, and, as a reporter, created the station’s Investigative Team, winning numerous awards for her work. L’Ecuyer served as Public Information Officer for Phoenix Sky Harbor airport and as a Project Manager for the Phoenix Fire Department. As a trainer, producer, and coach, she specializes in teaching public and private organizations specific techniques to aid in dealing with the media before a crisis occurs. L’Ecuyer received eight regional Emmy Awards and a variety of other recognitions for her work as a producer, reporter, and communicator.